Have you ever considered the additional equity value a roof restoration could add to your home? Roof restorations can offer you anything from much needed repairs, to an aesthetic facelift for your house and they can have a significant positive impact on the valuation of your property. If you’ve been searching online for terms like, ‘Roof Restoration Brisbane‘, ‘Brisbane Roof Restoration‘, ‘Roof Repairs Brisbane‘, ‘Roof Repair Brisbane‘ or similar variations, then talk to the experts at Strongguard today. When it comes to Brisbane roof repairs, Strongguard are your local experts. We offer a comprehensive range of restorative services that are designed to bring your roof back to life. Our team specialises in roof repairs, roof painting and tile roof repairs. With our expertise, your tiled or metal roof will be in better condition than ever before. Strongguard has operated for over twenty years, so you can rest assured that you are in safe hands. Our business is centred on honest, reliable service, with high quality materials and unrivalled workmanship. At Strongguard we have what you need, whether it’s a simple repair or a full overhaul and restoration. Roof restoration is a broad term that encompasses all the services required to keep your roof in good condition. At Strongguard, we aim to not only restore your roof, but also improve it. We understand exactly what goes into a high quality Brisbane roof repair, which is why we take the time to properly prepare each site. Our team takes a problem solving approach to each job and we will work with you to identify and resolve any faults. This includes identifying roof leaks, repairing damaged roof tiling, repainting tiles or metal roofs and much more. When it comes to roof restorations in Brisbane, choosing the right products is critical. The hot and often unpredictable weather can really test your roof. For this reason, we only use products that we know and trust. Over the course of twenty years, we have gained comprehensive experience with a range of products. This has allowed us to determine which products are up to the challenge. At Strongguard, we know that roof repairs and restorations require careful planning and a targeted approach. Our extensive experience and time in the industry has allowed us to refine our restoration process. We recognise that the quality of the job is centred on attention to detail and workmanship. That is why we have a stringent quality control process. With Strongguard, you can rest assured that your roof restoration will be of a high quality. The first and arguably most important step of any Brisbane roof restoration is repairing damage. Repairing damaged tiles, flashings, clips and valleys allows us to ensure the best quality finish and also prevents future leaks. It is vital that these repairs are conducted well, as the following steps of the roof restoration process depend on your roof being in good condition. 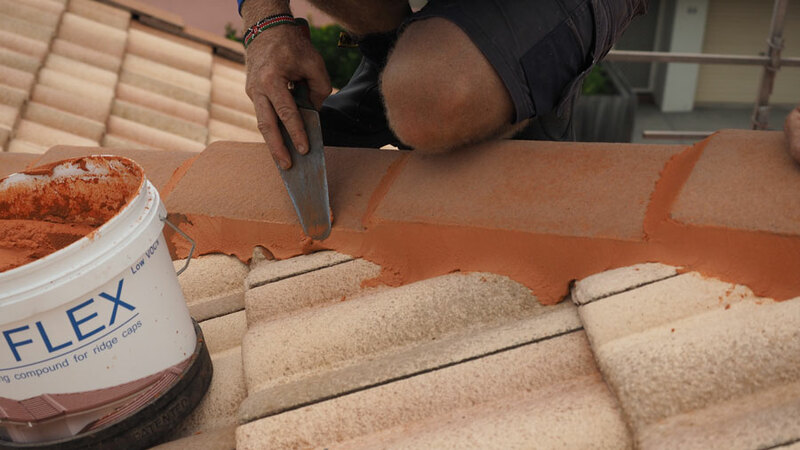 Searching For The Best Roof Repair Brisbane Wide? Contact Strongguard Today! Strongguard are experts at all Brisbane roof restoration jobs. Our team strives to meet your needs and with over twenty years of experience in the industry, we are well positioned to deliver. If your roof is looking a bit worse for wear, get in touch. You can call our office or contact us online through our website. Our friendly staff are always happy to take your call. #1 Will you leave the job site clean when you finish? Here at Strongguard, we believe that cleanliness and service is the key to client satisfaction. We treat your home as if it were our own, which means you are guaranteed a clean service and great results. During the restoration of your roof, there is likely to be some rubbish leftover. This can include broken roof tiles or old guttering. Our team of roofing specialists will make sure all rubbish that accumulates during your roof restoration is removed. Throughout the entire roof restoration process, we will have your convenience and satisfaction in mind. This means that we will be mindful of site cleanliness and we will endeavour to minimise any inconvenience to you. We understand that the end result is only part of what we offer. The other part is reliable service, from experts that you can trust. #2 How long will my restored roof last? At Strongguard, our Brisbane roof restorations are designed to not only restore you roof, but also improve it. This means that the end product will be a roof that is more durable and better looking than ever before. We are confident in the quality of our work and in support of this, we offer a ten year warranty. This warranty covers workmanship and roof membrane, so the beautiful and durable finish of your roof is guaranteed. Generally speaking, your newly restored roof should go ten to fifteen years before further repairs are needed. However, we do recommend that you conduct periodic roof maintenance. This maintenance includes checking gutters and removing debris from your roof. This will protect your roof from damage and keep it looking its best. If you would like more information on your roof, or advice in regard to its upkeep, then contact us. Our friendly team is happy to discuss your needs with you and provide professional advice. #3 How much does it cost for you to restore my roof? Brisbane roof repairs and restorations vary in size and nature. Because of this, it is hard to give an exact figure in terms of cost. Generally speaking, however, roof restorations cost between $3500 and $6000. This price covers the entire process. This means that you get expert workmanship and quality products from leaders in the industry. If you would like a more specific figure, then contact our team. We have dedicated estimators who can provide you with a quote. In fact, we even offer free site visits and quotes in most cases. For insurance related jobs and commercial jobs, however, we do charge for site visits. If you would like more information on our preliminary procedures, then feel free to get in touch. You can contact us through our website, or you can call our office and speak with an expert. #4 How long will it take for you to restore my roof? It can be hard to say specifically how long a restoration will take, as there is such a diverse range of roof sizes and designs across Brisbane. As you would imagine, larger and more extensive jobs can take longer than their smaller and simpler counterparts. On average, roof restoration from Strongguard will take between two and four days. Our team of expert roofers are among the best in the business. In addition to this, our roof restoration process has been refined over the course of our twenty years in the industry. As a result, you are guaranteed efficient and effective service, no matter how big or small the job is. #5 Do you offer a choice of paints for your Brisbane roof repairs? Here at Strongguard, we offer a wide selection of high quality roof paints. We only work with paint from brands we trust, which means we offer Dulux and Shield Coat exclusively. You can choose from over 70 different colours, so your roof restoration is a great opportunity to give your home a facelift. In fact, we encourage you to explore your options and our team can help match your roof, with the paint colour you want.